A 53-year-old woman presented with a Hunt and Hess grade 1 subarachnoid hemorrhage. A, Digital subtraction angiography shows a wide-neck right posterior communicating artery aneurysm of approximately 15.49 × 3.72 mm. B, Angiography shows contrast extravasations during coil insertion after tirofiban injection and stent deployment. We packed the aneurysm with more coils while maintaining tirofiban. C, Immediate posttreatment angiography shows cessation of contrast extravasations and complete occlusion of the aneurysm. 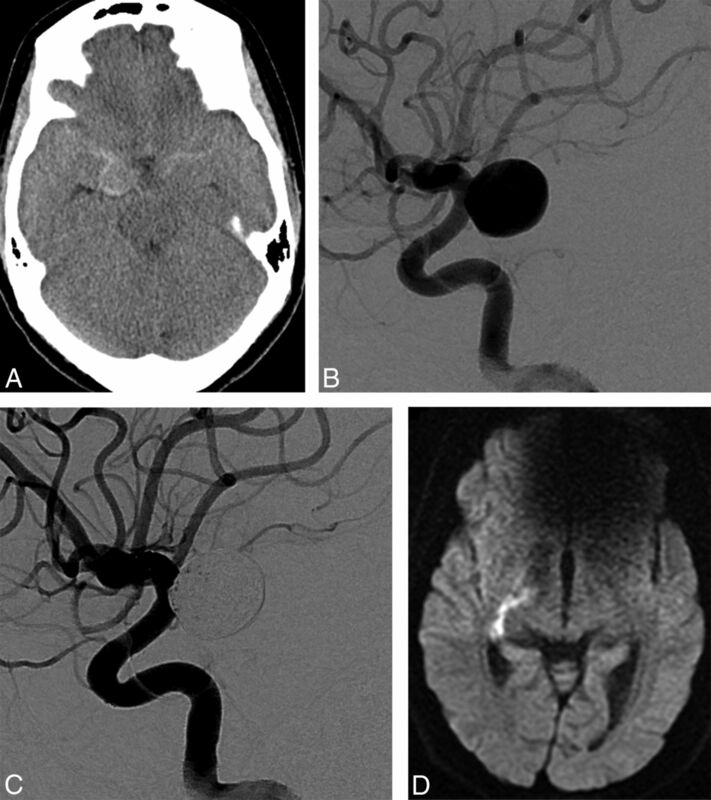 A 54-year-old woman presented with a Hunt and Hess grade 4 subarachnoid hemorrhage. A, Initial precontrast brain CT scan shows subarachnoid hemorrhage and hydrocephalus. An external ventricular drain was placed before stent-assisted coiling. B, Immediate posttreatment precontrast brain CT scan shows asymptomatic ventriculostomy-related hemorrhage. The hemorrhage was small and occurred along the catheter tract. 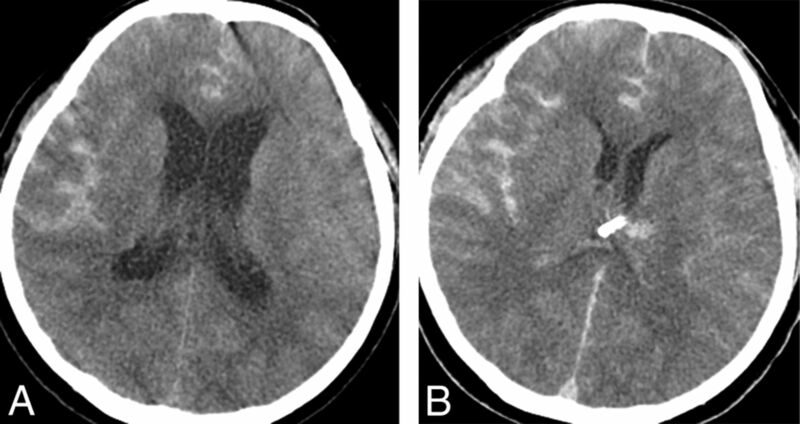 A 7-day follow-up brain CT scan (not shown in Fig 2) shows disappearance of the hemorrhage. A 44-year-old woman presented with a Hunt and Hess grade 2 subarachnoid hemorrhage. A, Initial precontrast brain CT scan showed subarachnoid hemorrhage. B, Digital subtraction angiography shows a wide-neck right posterior communicating artery aneurysm of approximately 11.3 × 12 mm. C, Immediate posttreatment angiography shows complete occlusion of the aneurysm and normal patency of the anterior choroidal artery. D, Diffusion-weighted MR imaging shows infarction of the posterior limb of the right internal capsule on postoperative day 7. Note:—ICH indicates intracerebral hemorrhage; IVH, intraventricular hemorrhage. ↵a Percentages were obtained in relation to the number of patients in whom ventriculostomy was placed before or after coiling (n = 10), whereas other complications are over the total number of patients (n = 40).